WASHINGTON (CNN) -- The U.S. military carried out an airstrike against an al Qaeda operative in southern Somalia this week, the second strike this month, U.S. military officials said Wednesday. The strikes are the first overt U.S. military actions in Somalia since the U.S. military pulled out of Mogadishu in 1994, months after militia fighters loyal to a Somali warlord shot down two Black Hawk helicopters, killing 18 U.S. special operation troops. In this most recent strike, a U.S. Air Force AC-130 gunship attacked Monday overnight into Tuesday along Somalia's southern border with Kenya. The airstrike was aimed at a "midlevel al Qaeda operative," according to a U.S. official.The operative survived the attack and was taken into custody by Ethiopian forces, according to the official. About half a dozen other people were killed, but there was no information on their identities, an official said. The United States has been closely watching the region for al Qaeda operatives on the run since the militant Islamic Courts Union was recently driven from power by Somali forces, backed by the powerful Ethiopian military. U.S. officials have accused the Islamic Courts Union of harboring al Qaeda terrorists, including the suspects in the 1998 U.S. Embassy bombings in Africa. The Islamists, which were driven from power late last month after seizing control of Mogadishu in June, have denied the allegations. U.S. Navy aircraft continue to conduct reconnaissance and surveillance missions over Somalia, the official said. In the earlier airstrike on January 7, the U.S. military targeted Adnan Hashi Ayrow, a member of the Islamic Courts Union, who is believed to have fought against the United States in Afghanistan. Ayrow is believed to have survived the attack. Initial reports indicated the January 7 strike targeted the three embassy bombing suspects, but a senior U.S. official in Kenya told CNN it was unclear if the three were in the region in the first place. From CNN Pentagon Correspondent Barbara Starr. 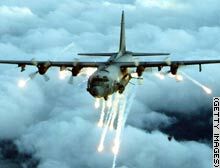 A U.S. AC-130 gunship in an undated photo. This type of plane was used in the U.S. airstrike in Somalia this week.